Most visitors to Grounds For Sculpture, as well as travelers in the area, are treated to a collection of monumental sculptures along the way there. Sculpture On The Way (SOTW) is a program of The Sculpture Foundation, an affiliate of Grounds For Sculpture. It was envisioned as a sort of breadcrumbs path to lead visitors to GFS. An additional facet of the program is to encourage property owners on the way to add their own privately acquired sculpture to their land. This multi-part blog will take the reader on a tour of these pieces similar to what is experienced when driving. In this entry, we’ll begin our tour on I-295 southbound. As you approach Exit 65B for Sloan Ave, you will see the first piece of SOTW on your right side. 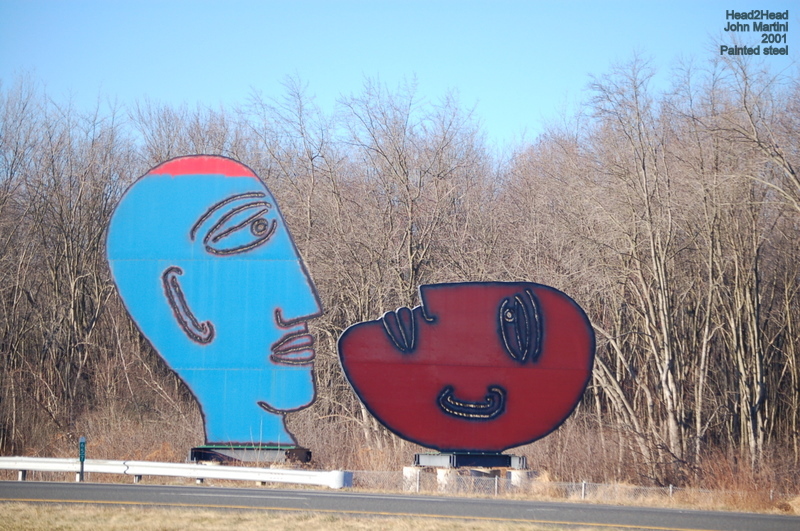 Head 2 Head, by John Martini is a two piece sculpture of a 30 foot high blue head and a 27 foot high red head, the latter lying on its back. Regardless of where the driver enters I-295, the roadside is mostly wooded and then suddenly these two giant heads appear. Combined, the two pieces weigh a whopping 45 tons and form the largest work ever by this sculptor. Most of Martini’s work is created by cutting metal with torches. These torches leave burn marks that are a hallmark of his work. While Head 2 Head was created via a different method, the edges have been painted black to simulate the burn marks left by the cutting torches in his other works. Having whetted the appetite, you will exit I-295 just after Head 2 Head. 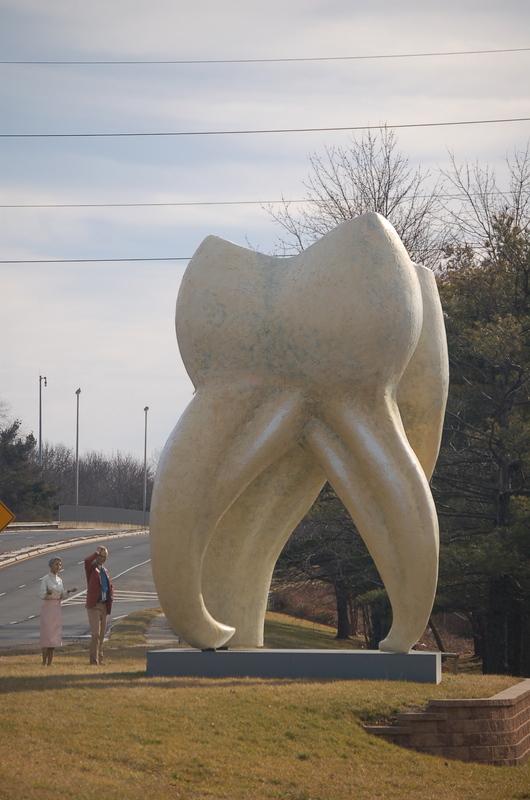 As you near the end of the exit ramp, a giant tooth appears straight ahead. For those who travelled northbound on I-295, this is the first sculpture you see. Comprehension is the name of this three piece sculpture by Seward Johnson. The tooth and the couple looking at it are part and parcel of Comprehension. In a 2008 interview in the Longboat (FL) Key Life, Mr. Johnson said of this piece, “Beautiful is art, but what is this? I also wanted to have fun with the ‘man in the street’ relating to abstraction and to play to the common response rather than the trained response.” So, look at it, enjoy it, and make of it what you want. Next up on your right hand side is King Lear, also by Seward Johnson. 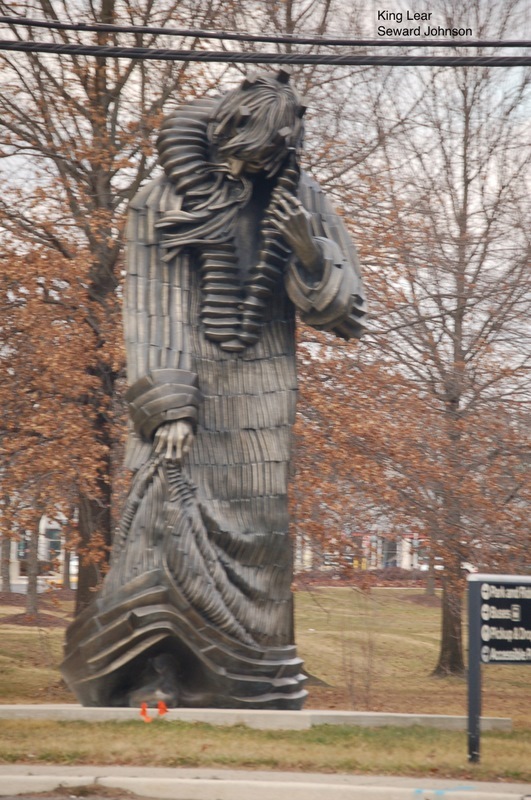 This 20 foot tall sculpture is made of cupronickel, a metal used in plumbing, marine vessels and those round objects in your pocket with a similar name. A more life size version of King Lear lives in the Water Garden at GFS. Then, you come upon what appears to be a party going on on the side of the road. Seward Johnson has taken a group of his 20 foot tall sculptures and placed them together. The two with the guitars are Los Mariachis. The couples, from left to right, are Turn Of The Century, Whispering Close and Time For Fun. 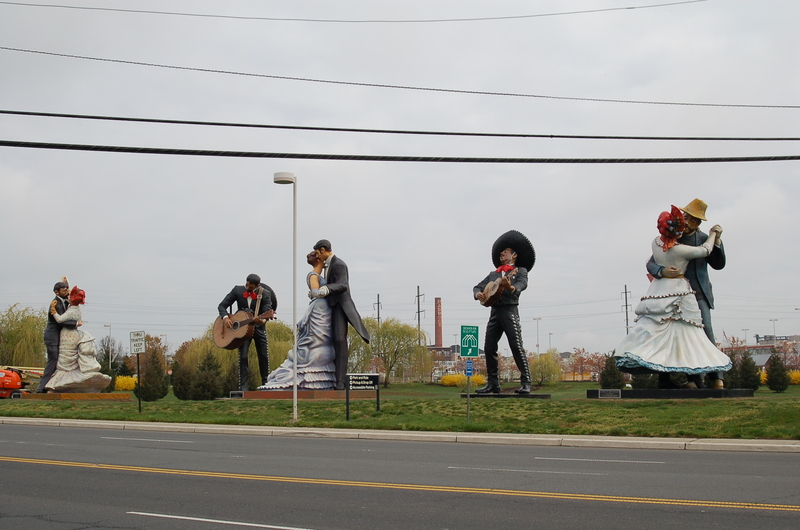 The next picture shows these sculptures from the back where it seems Los Mariachis are serenading the workers at the factory across the street, and the first workers have come out to dance. There are a few sculptures that you’ll pass that will be covered collectively in a future blog. 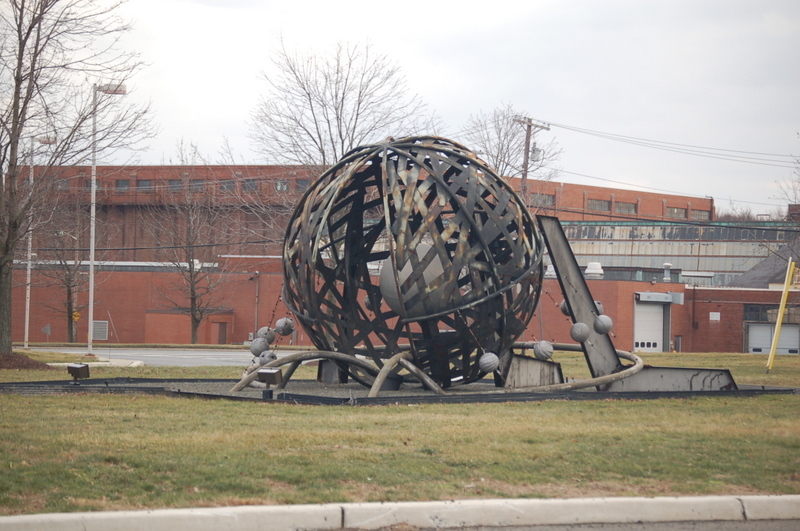 They are not actually part of The Sculpture Foundation’s SOTW but, rather, sculptures placed at the NJ Transit train station as public art, or placed by a property owner. We’ll skip them for now. As you take the jug handle to make the left turn onto Klockner Road, you will notice Fisher Stolz’s Sphere Of Influence. This steel sculpture presents an interesting contrast between fluid curves and hard edges. 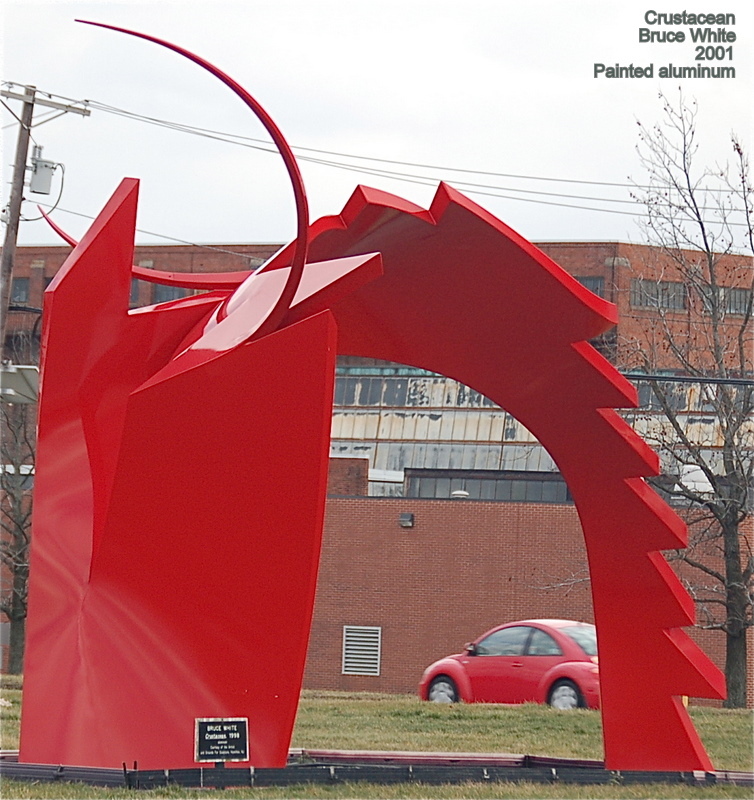 Nearby is Crustacean, a painted aluminum sculpture by Bruce White. It was quite serendipitous that a red Volkswagen Beetle (aka, Bug) happened to drive into the frame as the photo was shot. Still on the jug handle, we come to William King’s Unitas. This piece was originally installed at GFS and was moved to this location in 1999. It is positioned to be equally visible from either cars or trains passing by. Today, we left I-295 and travelled along Sloan Avenue exploring the sculptures on our way to Grounds For Sculpture. We ended this journey on the jug handle for the left turn onto Klockner Road. 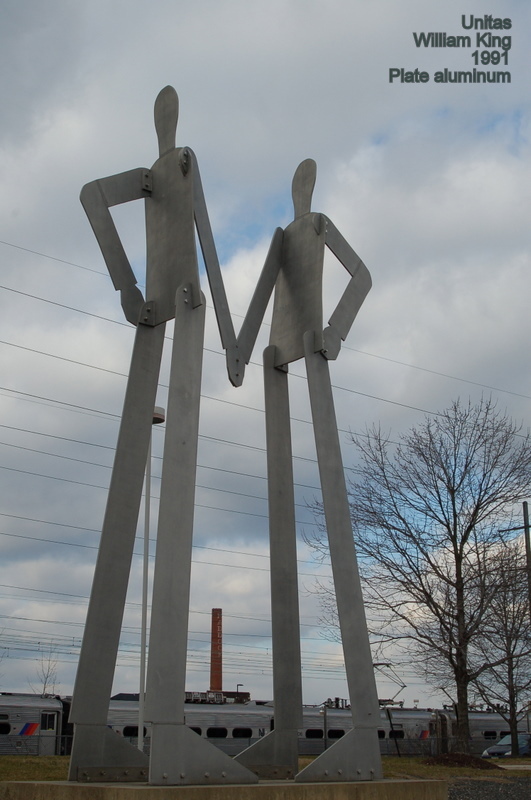 In the next installment we’ll take a look at Sculpture On The Way along Klockner Road. Jerry Williams is a volunteer/docent at Grounds For Sculpture. He is retired from the NJ Courts after over 33 years of service. He lives in HamiltonTownship, home to GFS, with his wife Brenda, also a volunteer, and their son. He seems to spend much of his free time at GFS.